1. Soak wood chips in water 30 minutes; drain well. 2. Preheat grill to medium-high heat using both burners. After preheating, turn the left burner off (leave the right burner on). Pierce the bottom of a disposable aluminum foil pan several times with the tip of a knife. Place pan on heat element on heated side of grill; add wood chips to pan. Let chips stand for 15 minutes or until smoking. 3. Combine chile powder and next 5 ingredients (through salt) in a medium bowl. Add chicken to bowl; toss well. Add oil to bowl; toss well. 4. Place syrup and next 5 ingredients (through red pepper) in a small saucepan. Bring to a boil. Cook until mixture is reduced to 1/2 cup and begins to thicken (about 3 minutes). Reserve syrup mixture. 5. Place chicken, meaty side down, on grill rack coated with cooking spray over left burner (indirect heat). 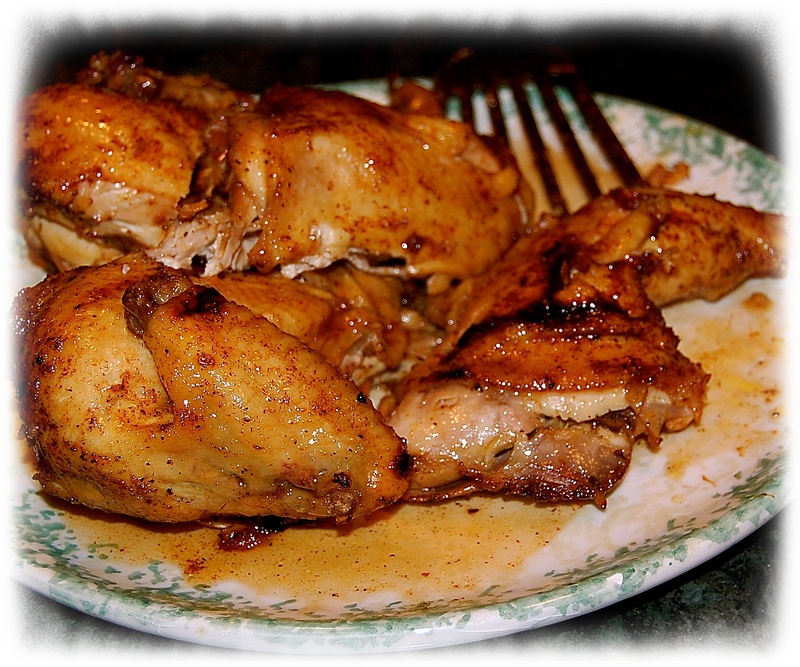 Brush chicken with 2 tablespoons syrup mixture; grill 15 minutes. Turn chicken over. Brush with 2 tablespoons syrup mixture; grill 15 minutes. Turn chicken over and move to direct heat; grill 5 minutes or until done. Garnish with cilantro, if desired. Serve with remaining syrup mixture and lime wedges.